Every online marketer has to make sure that the flow of new visitors into your PrestaShop is not ending. Traditionally paid Search Engine Advertising (SEA) on platforms like Google AdWords or Facebook Ads is the tool of choice. Unfortunately the market of buying new traffic for a website gets extremely expensive these days. This is due to the fact that more and more companies are throwing their marketing spent into these channels and because of the intelligent bidding algorithms of these platforms. This naturally leads to a higher cost-per-click (CPC) in total for everybody. 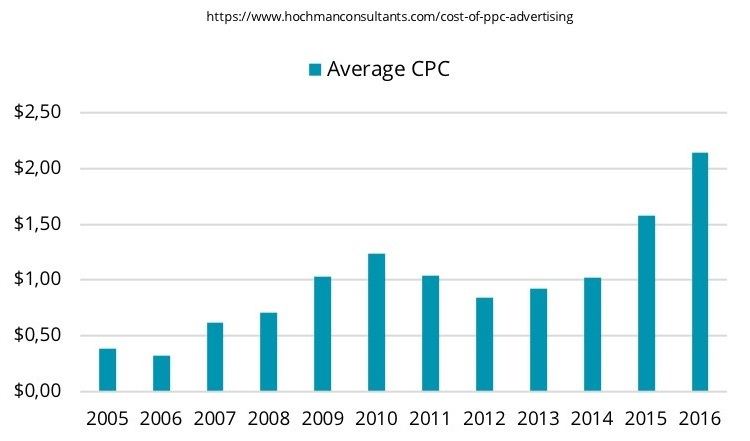 Which in turn leads to more marketing spendings and again to higher CPCs and this in turn again … a vicious circle. You see where this leads to: the only one that profits from this evolution is the platform itself. For example, the researchers in the following image showed that the average CPC for deliberately chosen industries arose from 0.38$ in 2005 to 2.16$ in 2016 which is an average increase of over 17% per year! In addition, from these expensively acquired customers the average conversion rate is at a low of 3 %, meaning that only 3 of 100 visitors generate any revenue for you. And we haven’t even considered the number of returned items in this calculation. That’s why companies are best advised to focus on converting their already existing traffic. Basically said you do not have to increase your marketing spent every year but spent it smarter instead. Sounds good, but how to do that? A better conversion rate directly influences the generated revenue: an improved conversion rate means more revenue for you. That’s why you should try to improve the conversion rate at its best. Ask yourself where are your visitors leaving your PrestaShop? Maybe they don’t find the right products they’re looking for or the catalog has always the same non-appealing look to them? Maybe the website is not perfectly mobile-optimized or users have to scroll very far to the bottom to find any useful information? Maybe the search results are poor or the product information is overwhelming? Addressing all these issues is no easy task but will definitely reward you with more revenue. Do you know where your PrestaShop visitors are coming from? Don’t spent lots of money acquiring new customers that redeem a coupon and then only buy once in your shop. Focus on your loyal customer base instead and improve their shop experience the most. Show them that they individually matter to you. How Can This be Reached Practically? an improved average order value. Personalization acts like an intelligent private shopping assistant that makes the lives of your visitors much easier by offering them products and content that they probably might like. With every action of your visitors in your PrestaShop, like a view of a product, a click on a button, adding a product to cart, purchasing items or going to the 404 page, the recommendation engine collects more data to improve the result of the recommendations. This data is then compared to the whole bunch of all visitors to find other customer groups matching the individual profile and generating recommendations out of it. Which Features are Essential to Choose a Recommendation Engine? Implemented correctly personalization can bring you phenomenal Returns On Investment. Additionally you do not throw the money out of the window but invest it into your own PrestaShop to become better and better and most importantly more unique for your users. This in turn results in more returning customers and these have a higher engagement with your PrestaShop. It’s also important to use a recommendation engine solution that is capable of reacting flexibly and instantaneously without any involvement of developers. Therewith you as a marketer or merchant are free to place product recommendations anywhere and in an unlimited number of widgets in your PrestaShop. Consider also flexibility in terms of channels: today you might only have your PrestaShop, but perhaps you also want to integrate intelligent product recommendations into your newsletters, your blog or transactional emails like shipment email to engage users to return to your PrestaShop. And think about tomorrow if you want to use the potential of WhatsApp, Voice Commerce or the Internet-of-Things: your personalization solution should be flexible enough to integrate with all these use cases. recommend only products with a high margin for you. Of course personalization is no simple topic and requires in-depth expert knowledge. That’s why simplicity of the chosen software product matters a lot. Choose a tool that is easy to manage for your team and where results of the recommendation performances can be gained easily. What Does That Mean to Me Now? Do not hesitate. Start today by leveraging personalization as magic technique to improve lots of your key performance indicators and to lower the costs of customer acquisition dramatically. Use the above mentioned checklist to choose a recommendation engine like Recolize that can be integrated right out-of-the-box and start gaining personalization knowledge and generating additional revenue.